*** Here’s a teeny tiny project for those attempting to go green but still have cold feet. Maybe this should be a ‘guess what it is?’ post instead? O.k. so what is it? O.k. so whilst you think about it, first a little back ground to explain the truly ironic nature of this tackle. Several life times ago I was married to a different man and therefore enjoyed a relationship with a different mother in law. The house of my mother in law, was like none other. Even now, some two and a half decades later, I have never experienced a household such as that. To say that the house was clean would be an atrocious understatement. Not only was it hygienically pristine, it was also ordered. Her whole house was immaculate. Not the immaculate of Homes and Gardens, but the kind of immaculate where screw heads were sanitized with a tooth brush. To say that it was tidy would be tantamount to a lie. For example, I slept in the spare room. The spare room housed spares, spares of everything. Each spare was lined up in the closet and when I say 'lined up' I mean you could take a ruler just to check that each item was exactly spaced within the available space. The twin bed spreads were hand crocheted, as were all the other bed spreads within the house,……but I digress. One of the most staggering, heretofore never witnessed by any living breathing creature, was the kitchen. To enter the kitchen was unwise unless you wore sunglasses. Bear in mind that this was England, mid winter where the light twinkled once every 24 hours on a Wednesday when there is an R in the month. 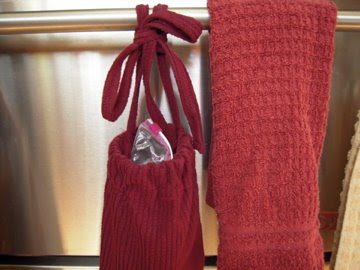 I would stand in the kitchen wearing my muffled feet on one single linoleum square in total awe as I watched my mother in law wash plastic bags in the sink and hang them up to dry so that they could later be re-used. I would remain static in part due to the three hounds of the Baskervilles that glowered in the hall ready to eviserate anyone who so much as dropped a hair follicle. I knew at the tender age of 18 that house-wifery was not the career choice for me. Later as I sat on a freshly laundered and ironed towel on the sofa, drinking Evian water from a dazzling, lead crystal tumbler, I wondered if I would ever reach such exotic levels of exactitude? So now, I know that I too have advanced to bag washing and recycling. 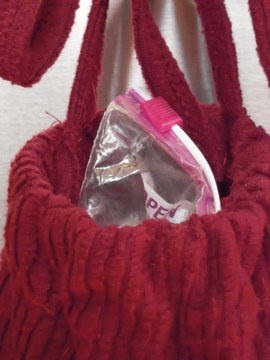 Furthermore, I have been reduced to making a bag, or rather a bag dispenser, for my washed bags, because for some reason, few people are willing to re-use a used bag when there are also new bags available. Thusly, the first thing to do, is to hide the box of new bags and instead display this handy dandy bag dispenser, stuffed to the brim with old or rather, newly washed bags for everyone to use. Now whilst I’m sure you’re clamouring for the ‘how to’ details, as luck would have it “Dioramarama” has step by step instructions over “here” which is just as well as I didn’t capture the moment myself. I would just add that the careful selection of the correct material or fabric is paramount if you wish to engender co-operation and participation by other family members. Forget colour co-ordinated, aim for soft, or better still, super soft, as we wouldn’t wish to damage those little digits, now would we? Posted on November 17th, 2008.